Perhaps not so wonderful for the shocked Nets, who gave up a 14-point lead with less than three minutes left in regulation and head home for Game 5 Monday trailing 3-1 in this first round series. 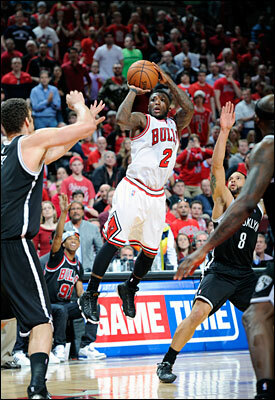 But the day was a bounty for basketball with one of the great individual playoff performances ever, Nate Robinson’s 34 points off the bench with 29 in the fourth quarter and the overtimes, including 12 consecutive in 1:42 after the Nets were leading 109-95 with 2:53 left in the game. It was the stuff of legend for the frenetic Robinson, the stuff of Isiah and Nate Archibald and World B. and Calvin Murphy and Downtown Freddie Brown and Iverson, the littlest guy taking on the biggest kids and making them reel in awe and wonder. Uncanny, unusual, perhaps unprecedented but hardly unskilled. It was like a video game with Robinson scoring 23 fourth quarter points, the second most in franchise history to Michael Jordan’s 24 in the 1990 playoffs. Robinson, basically after the game seemed over and many fans began to leave, accounted for 27 of the Bulls’ 35 fourth quarter points with nine of 11 field goals and a pair of assists. He set a franchise playoff record for most points off the bench and did it all in fewer than 29 minutes as he fouled out. “Nate (Frickin’) Robinson,” Luol Deng’s Twitter account announced with obvious awe and wonder after the game, if not shock. “Nathaniel. Nathaniel was huge,” enthused Joakim Noah, who rallied strong in almost 39 minutes despite his foot miseries with 15 points and 13 rebounds and led the team in overtime scoring with 10 of his points. Surely, Robinson was outstanding, but Kirk Hinrich with 18 points and 14 assists, Luol Deng with 15 points, eight rebounds and six assists and Boozer all set career highs in minutes played with each over 50 minutes and Hinrich with a few seconds short of 60 minutes even with an early calf injury in the game. Nazr Mohammed came off the bench after sitting the first two overtimes and most of the fourth quarter to make the clinching scores in the second overtime, including an offensive rebound on a Carlos Boozer free throw miss to effectively clinch the win with 19 seconds left in the third overtime. “I was happy to be able to get the rebound and make the shot,” said the usually impassive Mohammed, who slammed the ball down in defiance after he got inside Andray Blatche with a physical veteran move. “A couple of times I thought it was over and they came back and made shots. I was excited and happy. It felt like it was finally over. Like Noah following his own missed tip with 23.9 seconds left in regulation to tie the game at 111, and then Jimmy Butler saving the game as he stuffed Gerald Wallace just about to put in the game winning basket on a Williams drive. But they wouldn’t have without Butler’s defensive play. Then there was Robinson with a running bank shot off the left foot for what seemed like the winner with two seconds left in the first overtime for the Bulls first lead since midway through the third quarter. But then Joe Johnson, who had 22 points and half in the overtime, tied it with a floater with a tenth of a second left in the fist overtime. Two big shots in the last two seconds. How great is that? Johnson also had a big three-point play in the second overtime after the Bulls took a 127-123 lead with 1:18 remaining on a Noah dunk after a sharp Deng penetrating drive. But it had to be a devastating loss for the Nets, and not only because they fell behind 3-1 in the series. They played their game, sped up the pace, made it a high scoring game. So much so that this Bulls scoring set team all time offensive records for a playoff game: 142 points in a playoff game, which also was the most in the league in the playoffs in 11 years; a franchise record with 56 field goals; tied a franchise record with 109 shots. And in shooting 53.2 percent it was the highest since 1986 with more than 100 attempts in a playoff game. Of course, that also meant 134 points against coach Tom Thibodeau’s defense, including 49.5 percent shooting, which left Thibodeau only slightly less downcast than after the Game 3 Bulls win. 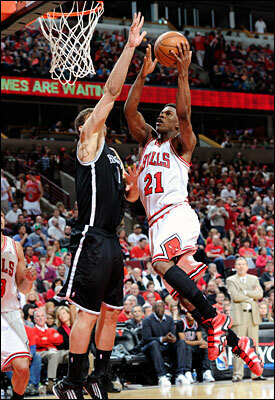 But there were the Nets getting the Bulls into their sort of game, Williams scoring 32 points in a terrific effort through three quarters, Brook Lopez with 26 points and 11 rebounds on some strong play around the basket and previously comatose forwards Gerald Wallace and Reggie Evans combining for 32 points and 22 rebounds. And having a 14-point lead with the motor on the team bus starting to rev. And then blowing it, perhaps the most significant mistake being former Bull C.J. Watson missing a wide open, uncontested breakaway dunk with 3:16 left in regulation as he was about to give the Nets a 16-point lead and certainly be sending everyone streaming for the exits. You have to feel badly for the quiet Watson, who had earlier in the game scuffled with Robinson and who made that brutal mistake pass to Omer Asik to essentially close last season’s playoff clinching loss to the Philadelphia 76ers. That’s a scarlet letter of basketball shame you never forget. Especially in a game like this, even if it is a first round playoff game between teams not exactly expected to contest for a championship. The Bulls never have lost a playoff series when leading 3-1, though when they were they generally had better and certainly healthier—and likely less fatigued—players. Noah, who admitted a week ago he didn’t think he even could play in this series, blew through his supposed playing time restriction, which he says he doesn’t have anymore. Though he does say the pain and discomfort from his plantar fasciitis remain present. Hinrich after as good a game as I’ve ever seen him play on both sides of the ball was almost shuffling out of the locker room after 59:26 playing, including every minute of the fourth quarter and all three overtimes. In some respects, actually, the myriad injuries the Bulls have endured all season have done some good as Thibodeau used more bench time than Nets coach P.J. Carlesimo and was comfortable enough to bring in Mohammed at a crucial time, though Noah and Gibson had fouled out, and continued to ride Butler. It’s not quite a body bag. But the Nets return home after their best game of the series, outrebounding the Bulls, shooting 57.1 percent through regulation when they were also shooting 60 percent on threes and getting that big scoring game from their supposedly esteemed backcourt and an engaged Wallace, who has been complaining about his lack of activity in the games. Yet, in a stretch of a few minutes a chance to go home and take control of the series became a sporting classic and a big hole with dirt being hauled to the site. Perhaps not out loud, but they won’t forget this one for a long time while their dreams and nightmares play it over and over again and again. This one began unremarkably enough, if curiously with offense that seemed to swing the pendulum to the Nets. The Bulls defense has been the star of this series with the narrative if the Nets could push the pace there was no way that Bulls team could score enough. It was reminiscent of the way the Bulls of the late 1980’s saw the Pistons. The Bulls always said they’d win if they could get the games over 100 points. But how? Plus, there was the quick turnaround from Thursday night, which would seem to favor the team that was coming in with the adjustments. The Nets did going strong to Lopez against the again slow starting Noah and Mohammed. The Nets then more quickly went to their three guard set with Watson to spread the court for threes, and Wallace got himself pumped up with his comments to the media about not knowing his role and came in pressuring Deng and flying around the court. The result was a 26-25 first quarter start for the Nets despite the Bulls jumping off 10-5, and you got the feeling the Bulls were getting themselves into something they were unprepared for. But they were also making points for later. Hinrich was shadowing Williams everywhere. Williams has been terrific since the All-Star break, more like the All-Star he’d been than the expensive copy he seemed to become. He’s unusually strong for a point guard, and few will play him physically while running with him side to side as he’s the engine that powers the at times deliberate Nets halfcourt offense. Thibodeau basically matched Hinrich with Williams—though Butler some later after Hinrich got a fifth foul late in the fourth quarter—and Noah with Lopez. And though Williams was carrying the Nets through most of the first three quarters, it perhaps was hardly coincidental he wore down and was two of 11 shooting after the third quarter including being unable to finish that potential regulation game winner. The Nets kept the offensive pressure on in the second quarter, which was highlighted, or lowlighted, as it were, by Robinson and Watson, who have been bumping and menacing one another in this series, getting into it and the teams rushing to separate them after Robinson seemed to take exception to a Watson push off. Neither said much about it afterward as they were assessed technicals, and then soon several fouls that sent them out of the game. The Nets would go on to shoot 45 free throws to 29 for the Bulls, though Carlesimo afterward complained about “some tough calls that went against us.” Though you might have heard plenty about that from the Bulls if they had lost. As it was players shrugged about a ”tough whistle” that had three players foul out and two with five. Hinrich also made one of those great diving-into-the-dancers saves and was very aggressive looking for his shot, which has been much better and much needed by the Bulls. 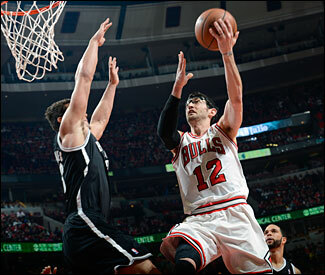 Hinrich was seven of 12 shooting and two of four threes. 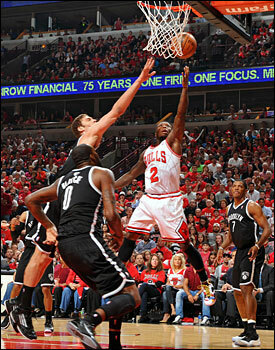 The Bulls had taken a 57-46 lead late in the second quarter with Hinrich getting 11 points in the second. But Williams also was making plays, and even though the Nets trailed 58-55 at halftime, they liked their comeback and the score. The Bulls, as they are wont to do at times lately, began to forget to look for Boozer, who now is averaging 20.3 points and 11 rebounds in the series. But the Bulls haven’t been good reposting as the Nets have been fronting and overplaying Boozer. And after the first pass back out the Bulls tend to look elsewhere and not get back to Boozer for offense. Thibodeau clearly tried to remedy that coming out after halftime with the first plays for Boozer. But the Nets grabbed hold of the game with a 17-5 run as Noah struggled shooting a few airballs, the Bulls kicked away a few possessions, the Nets got out in transition after, and Williams strutted into a jumper and a three for a 77-71 lead midway through the third. It looked ominous for the Bulls as Robinson tried to save a ball throwing it off Watson. That’s fun also for Nate. It bounded out to Lopez, who made the first three of his playoff career for an 84-76 Nets lead after three. That shot seemed to drive the Nets, who steamed into the fourth quarter seemingly to put the game away as Wallace made a three to make it 91-82 with 8:38 left. And then after a Robinson 20 footer, the Nets reeled off five straight with a Watson three point play beating Robinson. Who could only be getting angrier, but seemingly what good would it do now trailing. Robinson answered as he gets in these little contests, especially with Watson in this series. But Williams then added another three, Lopez scored and Wallace dunked beating the Bulls down court, making it 109-95 Nets with 3:45 left. Then came the big moment that nobody saw coming or imagined it would end up being. It began with a Robinson error as Watson stripped him at midcourt and you could hear the audible groan in the crowd as that certainly would be the party’s over anthem. It began with 2:53 left in what seemed like just padding your stats with a Robinson three. But Lopez missed a 21 footer and Robinson drove for a layup as Boozer cleverly nudged Wallace out of the way. The Bulls then did a little hack-a-Wallace and he missed both as he and Evans were a combined 10 for 21 on free throws. Robinson then made a 16 footer to get the Bulls within 109-102 with 2:08 left and Wallace and Boozer got to pushing around and got double technicals as this was getting nervous. Wallace knocked down Deng for an offensive foul. And then with Williams trying to overplay Robinson, Williams fouled Robinson shooting a three. Robinson made all three to suddenly get the Bulls within 109-105 with 1:41 left. Now it was open to debate. It was defense as well now, finally, as Thibodeau may have thought. Hinrich smothered Williams, who missed on a driving layup. Robinson, yes again, then made a 14 footer over a Hinrich screen as they worked well together in the backcourt. Robinson then pressured Watson trying to get the inbounds pass after a timeout. Watson stumbled and by the time he was again in position the officials called a five-second violation for a turnover and Bulls ball trailing by two with 1:11 left. Robinson, always enthusiastic and urging on the crowd, began pumping his fists. Noah then drove the ball, drawing the defense as he passed to Robinson and who them found Boozer for a reverse layup to tie the game at 109 with 55.4 seconds left. Lopez got the ball and was fouled by the Bulls, making two. But Noah came through big rebounding a Deng missed three, trying a putback, missing and getting it again over Lopez and putting it in two hands for the tie at 111 with 23.9 seconds left. The Nets ran it down for the last shot, which Williams took and Butler blocked the follow. 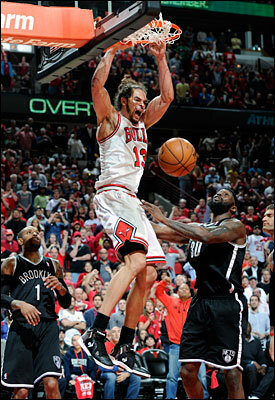 It has been a terrific and even unexpected performance as unable as Noah seemed in the Game 1 loss in Brooklyn. But he’s come back since, especially in that big fourth quarter in Game 2. “Feeling,” Noah said with a knowing smile when asked afterward how his foot felt. “Feeling. I’m feeling it. It was a great environment; the crowd was great. As the game goes on, you stop thinking about it and get caught up in the moment. It’s bigger than your foot. This is what it’s all about. This is a resilient group. We’ve been fighting through adversity and things all year. To be in this position now going to Brooklyn..but it’s not going to be easy. But it would be a bit before the Bulls would feel that as they endured three excruciating and thrilling overtimes, the first with that great Robinson and Johnson exchange in the last seconds after Boozer had made a pair of big plays with a pass to Noah for a score and finishing a pass from Noah after the Nets earlier had led by three. In the second overtime, it was Johnson fighting off the Bulls after they’d gone ahead 127-123 on a Noah dunk as Noah even began the overtime with a rare jumper for this series. “I had to see one go down,” he said of his shaky shooting. And then, finally, after the Bulls bolted to a 135-130 lead to open the third overtime with Gibson and Deng making jumpers after a Butler score on a good Hinrich inbounds pass in an impressive show of endurance, it was Mohammed closing it with a jumper off a pick and roll with Hinrich and that last offensive rebound. And then all everyone could take about was Robinson, who entertained the media with his unbridled enthusiasm. And combustible. And this time it’s the Nets who were burned.